Wide receiver Jared Abbrederis returned to the practice field on Sunday. He’s back after missing a pair of games with rib and chest injuries suffered in the Green Bay Packers loss to the Detroit Lions on November 15. 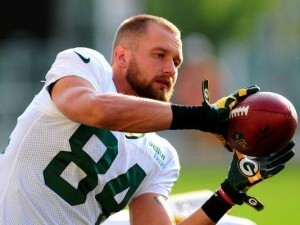 Abbrederis took part in a short workout on Sunday as the Packers get ready to face the Lions in Detroit on Thursday night. Abbrederis made four catches for 57 yards in the 18-16 loss to the Lions. He left the game after a 32-yard catch that was followed by a big hit from Lions safety Glover Quin. Abbrederis told reporters on Sunday that there is no timetable for his return. He said some pain and discomfort is still present and didn’t offer any kind of timetable for his return.